Call details: Entries may include 2- and 3-dimensional media, such as paintings, drawings, photography, mixed media, installations, ceramics, jewelry and sculpture. Submissions must be the original work of the applicant(s). Open to international artists. Apply using the online form. The Gold, Silver and Bronze artists will be featured in the ArtAscent Art & Literature Journal complete with artist profile reviews written by our art writer. 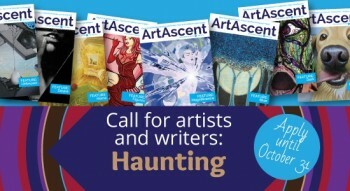 Up to 30 artists in total will be published in ArtAscent Art & Literature Journal; showcased, along with website links, in an online exhibition on the ArtAscent website for at least two years; and, promoted on the ArtAscent Facebook and Twitter feeds.